With Motorcycle Season Comes Danger | Phoenix Personal Injury Law Blog - Breyer Law Offices, P.C. blog home Motorcycle Accident Time to Rev Up for Motorcycle Safety! Motorcycle enthusiasts are starting to rev up for riding season in Arizona! Now is the time to dust off the bike, top off the fluids, and inspect the tires. It’s also the time to start thinking about safety. According to the National Highway Traffic Safety Administration, over 80% of all reported motorcycle collisions result in injury or death to the rider. In an effort to promote awareness and ensure more people are kept safe on the road, two officers in Mesa are taking action. Travis Rowland and Tom Lombardi have started a motorcycle safety course for civilians. The course is intended for those with basic motorcycle skills already, and is a modified version of the motorcycle training the pair once provided to police officers. According to the Arizona Department of Transportation (AZDOT), there were a total of 2,907 motorcycle crashes within the state in 2017. Of those crashes, 156 were fatal for the motorcyclist, and 2,274 resulted in serious injury. The worst collisions involved both a motorcycle and a moving vehicle. AZDOT also found that riders between 25 and 34 years old had the highest amount of crashes with 688. Those between the ages of 45 and 54 had the second-highest number of accidents at 526. According to AZDOT, 227 riders who reported wearing a helmet also reported no injuries. Only 65 of those who said they did not wear a helmet could say the same. It’s a fact that motorcyclists face more risks than other drivers. There is no steel frame surrounding them, and no airbags in case of an accident. Typically, all a biker has for protection is his own skill, some protective clothing, and perhaps a helmet. If a biker gets into an accident with another vehicle, he’s going to suffer far greater injuries. The other main risk motorcyclists face on the road is other drivers. Motorcycles are smaller and harder to see compared to other vehicles. Add to this that many motorists don’t look for motorcycles the same way they do other vehicles. 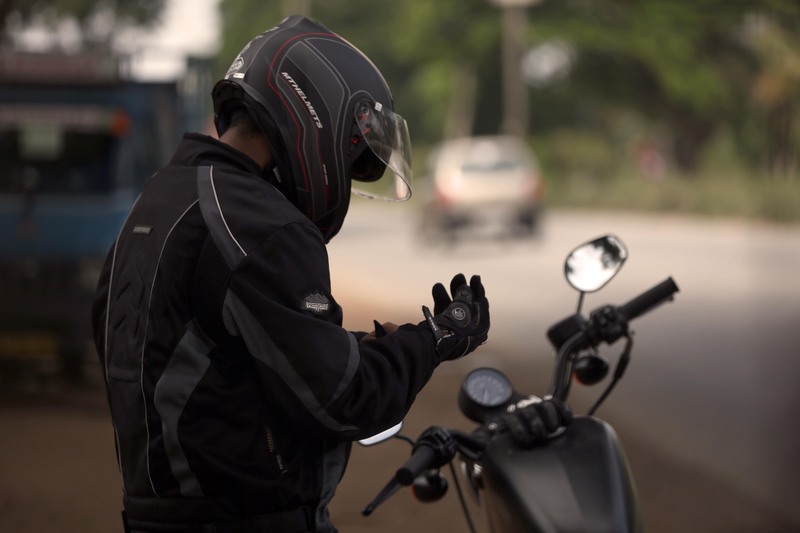 Most of the time, when a collision occurs between a motorcycle and another vehicle, it’s because the other driver did not see the motorcyclist. While motorcyclists cannot control the actions of other drivers, there are things they can do to help keep themselves safe on the road. Firstly, take a motorcycle safety course, such as the one being offered in Mesa. These courses can teach students about traffic laws that apply to bikes in Arizona, and how to react in emergency situations. Second, even after taking a course, motorcyclists should ride at their own skill level. Although it may look exciting when motorbikes do all kinds of stunts on television, those are performed by professionals. It won’t be nearly as exciting if, after attempting a trick, the rider ends up hurt. Lastly, it’s important to use common sense and follow all traffic laws, including the speed limit, on every ride. Riding should never be done in poor weather; proper riding gear should always be worn; and a reasonable speed should always be maintained. While motorcycle riders should do everything they can to keep themselves safe on the road, they can still end up in an accident. Contrary to some biases, motorcyclists are not always at fault for wrecks. For injury expenses and more, riders should always contact a lawyer who can help them claim the compensation they deserve. If you have been injured in a motorcycle accident in Phoenix, call Breyer Law Offices, P.C., today at (602) 267-1280 so we can begin reviewing your case.